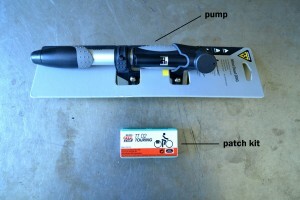 Patch Kit: It’s smaller and lighter than a tube and will work for any tire size. Standard glue patches work better than self stick patches, but both will get you home. Check out our last post for step by step patching instructions. Pump: Once you repair the tube you’ll need to get air back into the tire. There are different pumps for different tire pressure needs. They’re usually labeled ‘road’ or ‘mountain.’ Road pump will get your tires up to a higher pressure (over 65-70psi) with less work, but might take more pump strokes to do it. Tire Levers: Tire levers are not always necessary, but will make tire removal much easier. Always carry two with you just in case one breaks. Wrench for wheel removal: If your wheels are quick release you won’t need to carry a wrench. For bolt on wheels or special security skewers, you will want one. 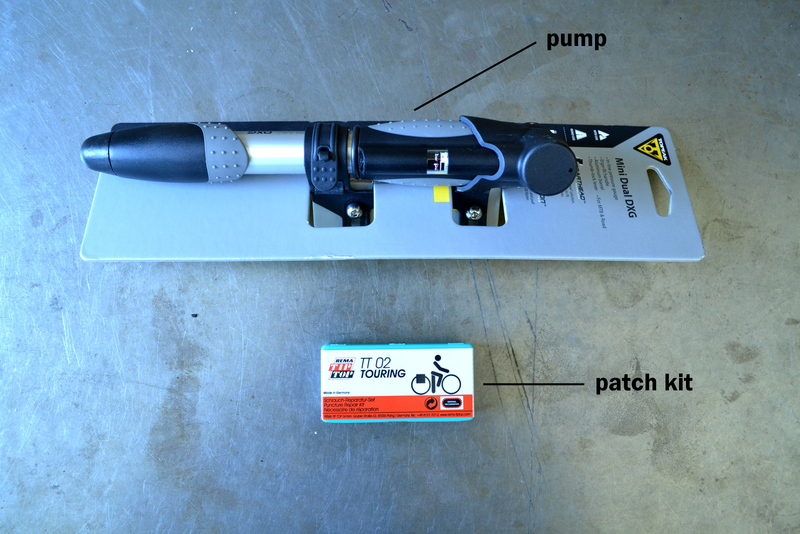 It is possible to patch a tube without taking the wheel off, but it’s not easy. 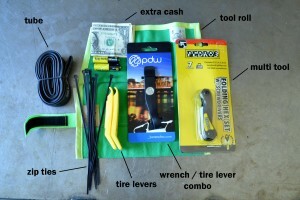 PDW and Surly make small 15mm wrenches that fit in any bag. Tube: It’s easier to replace a tube, rather than patch it. Carrying a tube will keep your flat fix time to a minimum. Look at the side of your tire to figure out what size tube you need. Small multi tool: The style of multi tool you carry will depend on the style and age of your bike. For older bikes, a small adjustable wrench might take care of your needs. For modern bikes, you’ll want a tool with at least a 4, 5,and 6mm Allen wrenches and both Philips and flathead screw drivers. A chain tool is recommended for longer leisure rides, but might be overkill for your commute. Other helpful items: Other handy things to include in your repair kit could be a little bit of extra cash, plastic zip ties, and extra batteries for your lights. Once you have all these items, you’ll need a way to carry them. If you always park your bike in a safe and secure location, a seat bag is a great option. It’ll keep the weight on your bike and you’ll always have the stuff with you. If you frequently lock your bike in public places, you might consider carrying these items in a tool roll or bag inside a backpack or pannier. Either way, keeping these items together will keep them from getting lost; just keep in mind that items left on the bike might get stolen. If you’d like to see what we carry in our bike shop, or if you would like some help with compiling your own repair kit, stop by our shop and speak to one of our friendly mechanics.